SAP is one of the leading ERP systems in the world. In various industries SAP systems are the leading system that ensure smooth work cycls and processes in a company. This encompasses all work categories from order management to production management. Various SAP modules are designed to make workflows work as best as possible by being highly specified to suit the respective work profile with its many different tasks. In production environments the OPC Router is implemented closely aligned to PP (Production Planning an Control), or PP-PI (Production Planning – Process Industries), or PM (Plant Maintenance and Service Management), QM (Quality Management) or EWM (Extended Warehouse Management). To access SAP, all necessary SAP interfaces are made available through the OPC Router, which offers connectability with RFC, BAPI und IDoc (Example in the Screenshot). Thus, SAP data can be distributed and transferred to other systems in mulitple ways, as well as transferred from other systems into SAP. For another example watch our video on YouTube. Connecting SAP systems with the OPC Router as connector allows the transmission of product-relevant data right through to the PLC, SCADA, labeling machine or printer, or any other interconnected devices or systems in your specific production environment. Manual work cycles can be avoided, as well as having to document work processes on paper. The integration of the SAP system into your production systems opens up many ways for data and thus enables the implementation of Industry 4.0. The basic idea that a customer order finds its way to the machine, from SAP to the PLC and back, becomes possible. The OPC Router allows you to network your systems graphically. A high variety of plug-ins turns the OPC Router into a powerful data hub for industrial applications. 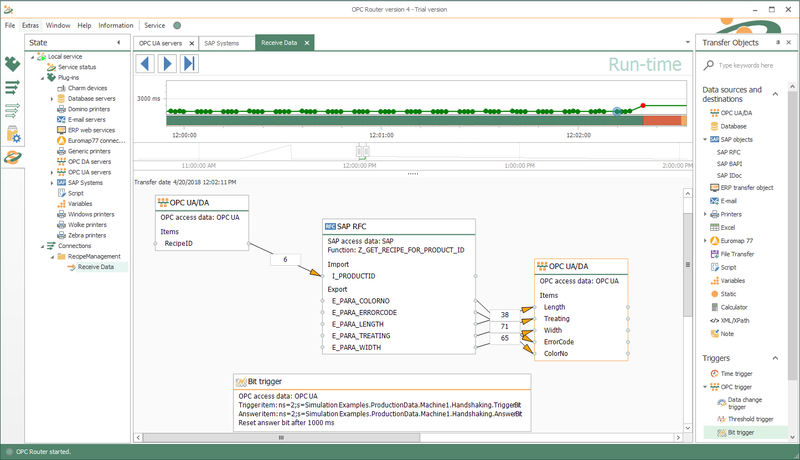 The integration of systems in SAP is very comfortable and simple with the OPC Router as middleware: Plant connectivity by drag and drop. Easy configuration, sophisticated monitoring and robustness are main distinguishing features of the OPC Router. The SAP systems plug-in makes three transfer objects avaible which each repectively connect to RFC, BAPI and IDoc. A function is called in an SAP system via RFC. Import and export parameters of different types can be addressed (simple, structures, tables). Calls are synchronous. BAPIs are standard interfaces of the SAP system and enable access to methods of business objects. Similar to RFCs, functions are addressed and their parameters (simple, structures, tables) are made available. The call is also synchronous. The IDoc data format is used for asynchronous data transfer. IDocs are structured documents that are used to send and receive transaction-based data to the SAP system. The SAP systems plug-in has its own RFC-Trigger. The RFC-Trigger allows availability of all RFC functions through the OPC Router. The can be addressed from within a SAP system by registering the OPC Router as external system in SAP. Wenn the RFC function is called in the OPC Router, data can also be transferred, which have been made available as data fields in that connection through a trigger. The SAP systems plug-in can browse RFCs, BAPIs and IDocs that are available in the respective SAP system. For the types RFC and BAPI, the existing functions and objects can be filtered and selected. In relation to the selection, the simple, the structured and the table parameters are then made available for selection. The IDoc types configured in the SAP system are read out by the OPC router. The structure of the selected IDoc is then displayed in the object so that the desired data fields of the IDoc can be used in the structure of the transfer. How do Transfer Objects, Triggers and Browsing work? The connections the OPC Router establishes between systems can be addressed with the core functions of the OPC Router. Depending on the nature of the respective plug-in, functions vary, which is due to the functional scope of the respective connected systems. Inside the OPC Router configuration, the transfer object abstracts the respective system of any connected system into a simple data input and data output block. Thus, the functions can be treated in the same way although each connected system has very individual features. Triggers determine execution time of data connections. Various triggers can be used for these connections, independent of transfer object type. Within each connection, several triggers can be used together via AND/OR-connections. Easy browsing also makes data field configuration easy when establishing transfer objects in order to establish the respective interface connection. The browsing mechanisms may vary, depending on the system and its available plug-in. Many plug-ins that are available for the OPC Router offer easy search and selection tools for quick identification of respective data fields without the need for specific knowledge about inherent subsystems. The user can easily browse through the data. Data source structures may vary according to the specification of each respective plug-in.